Boland Park Hotel Lodge is situated in the famous Garden Route, nestled in-between the Fynbos fauna and flora , in the laid back coastal town of Mossel Bay, where safe living is still a given! The 45 bedroom hotel provides uncomplicated family orientated comforts in a charming lodge style setting with comfortable, spacious bedrooms and self catering units to suit every holiday maker or businessmen’s needs, on the doorstep of the newly developed Dias Beach a destination to simply enjoy the holiday excitement with family and friends. Boland Park Hotel & Lodge brings you a blend of the warmth of Africa with Kalahari hospitality. All décor is infused with the essence of Africa. Boland Park Hotel & Lodge offers various types of accommodation to suit your needs and pocket! Accommodation ranges from hotel rooms to self catering units that can accommodate up to 8 pax. The Beech Tree Restaurant is a family restaurant which offers meals throughout the day. Renowned for their friendly South African service and great variety Al la Carte menu for all palettes, from sea food dishes to mouth watering dishes served from the grill. Some of our famous dishes are; Tiger Prawns sautéed in chili and garlic oil with onion and peppers, 600gm flame grilled Spare Ribs, Medium spiced Chicken Curry, Chicken Tagliatelle with mushroom, tomato and garlic sauce topped with parmesan. 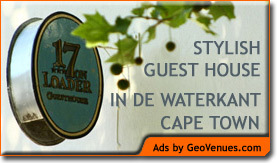 For guest house accommodation in Cape Town, be sure to stay at 17 on Loader Guest House – situated in Cape Town’s Historic de Waterkant Village. Click here to visit the website.